Although there are still a few hours of sun to be enjoyed outside, the first trends for the autumn and winter season 2014/2015 have already made themselves known. The annual fairs, such as the Tendence in Frankfurt, the spoga+gafa in Cologne, the Maison & Objet in Paris, the IFA in Berlin and the Orgatec in Cologne will again be showcasing all kinds of a wide range of wonderful new products this year. The main theme this Autumn and Winter is "new comfort". The home has always been a place of retreat. This Autumn, the main contenders for creating comfort will be natural materials such as wood, stoneware and wool. When it comes to furnishing elements and decorative objects, the dominant materials will be warm metals such as copper, brass or cast iron. The “new comfort” will be represented by the comeback of the good old wingback chair or sofas with side elements. Apart from home accessories and furniture that create cosy atmosphere through their natural materials and shapes, pastel tones are also back in fashion, with pink, light blue and mint currently being the favourites for accompanying us as smoky pastels or winter pastels through the cold months of the year. Stelton has drawn on these trends and given its popular vacuum jug a contemporary pastel look. 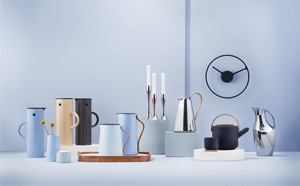 The Danish company is also launching a completely new line of products – the Theo tea collection – which comprises a unique fusion of Asian tradition and contemporary design. Rosendahl continues to build on solid tradition with its brands Kay Bojesen and Holmegaard. 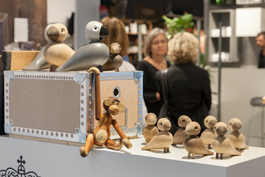 Holmegaard has expanded its successful series “Design with Light” by a decorative candle holder, while the Kay Bojesen collection now includes the classic wooden monkey in a new size. The Finnish company Iittala, primarily known for its glass and tableware, has been causing a stir by launching its first small furniture range. 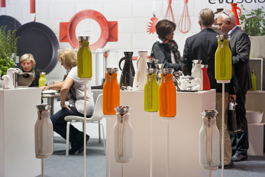 Keeping track of all these fairs and new products – some innovative, others newly interpreted – can be difficult at times. This is why this shop is ideal for up-to-date information on the latest products from the world of home design. Get inspired for your own living space decoration!